Victoria Cooper’s digital montage Stories from the Gorge scrolls, made over ten years ago were included in Toowoomba Regional Art Gallery show. 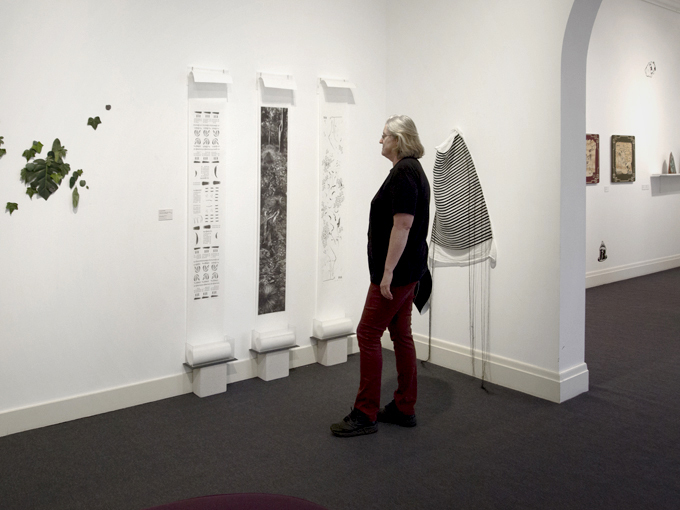 The exhibition was entitled Off the wall and was on show in Gallery 2 and Amos Gallery in May 2013. The works in the exhibition have been selected from the Toowoomba Regional Art Gallery’s City Collection. They have been placed simply together due to their three-dimensional nature and to highlight their derivation from the traditional two-dimensional picture plane. This exhibition demonstrates the way that artists manipulate physical depth within their works which can often create a greater engagement between the object and the viewer. Interestingly, many of the works in this exhibition focus upon environment, whether it is the natural, public or the domestic environment. Materiality is also a common consideration. Throughout this exhibition one can see the influence of ‘the collector’, artists who gather images or common materials, reusing and reinterpreting them to create their art. Victoria Cooper’s Stories from the Gorge: Order, chaos and the story of the hillside is a Chinese-landscape-scroll inspired series that represents “the last bastion of a natural chaos and order, an anti-culture, occurring on the fringes of agriculture.”[i] Human effects on the natural environment are central to Cooper’s practice and her prints and artists’ books in various formations lead the view from a flat two dimensional plane into the landscapes she investigates. These printed scrolls rise up from handmade acrylic boxes like the tall gum trees on their surfaces. Other artists in the Off The Wall show include; Michael Schlitz, Marieke Dench, Tiffany Shafran, Judith Kentish, and Brigid Cole-Adams and the exhibition will be on the wall until May 26, 2013. 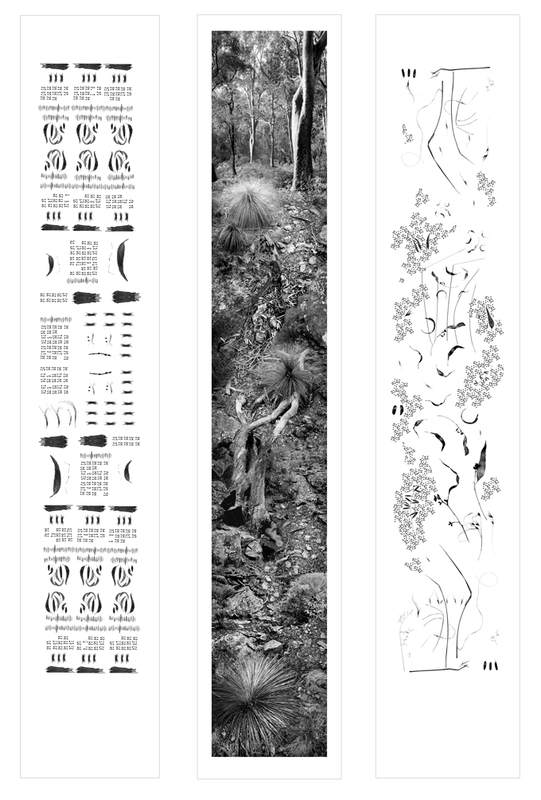 2002 –The triptych was acquired during its showing in the Toowoomba Biennial Acquisitive Award selected by Julie Ewington, then Curator at the Queensland Art Gallery..
Cooper’s scrolls were presented for the TRAG exhibition as a triptych, however in the original exhibition, entitled Searching for the Sublime, there were five scrolls. Searching for the Sublime was a collaborative project with sculptor Jim Roberts, fellow artist Doug Spowart and curator Deborah Godfrey. The inspiration for the project was a wilderness area in the Helidon Hills a mere 20 kilometres north-east of Toowoomba. 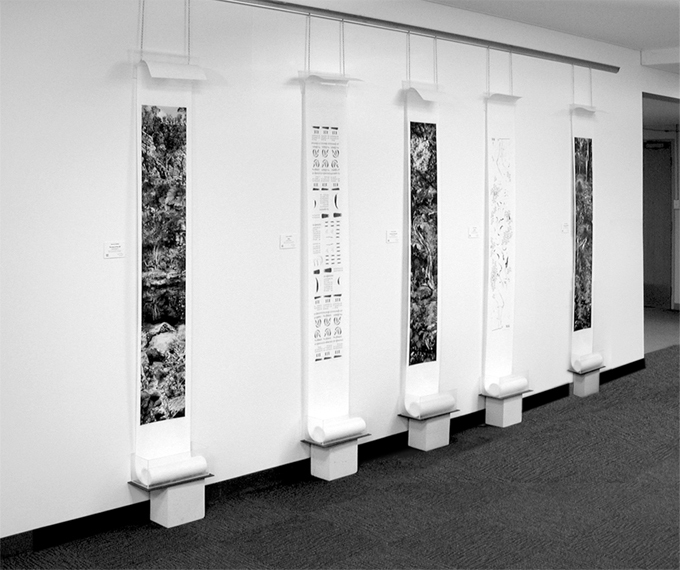 Supported by an RADF Grant, the show featured Roberts’ sculptures, Spowart’s abstract water photographs, and Cooper’s scrolls and was shown at 62 Robertson Gallery in Brisbane in August 2001. The images were assembled as a photomontage in the tiny, by current sizes, Blueberry iMac computer. At times Victoria juggled 200 layers in one Adobe Photoshop document to create the fiction panoramas. Seeing the whole image was a problem as most of the time Cooper’s view was no bigger than the iMac screen requiring her to ‘scroll’ the image up and down–just as you will do in looking at the images in this post. Saving the files took 20-30 minutes and the system often crashed. The images were printed in pigment inks on an Ilford Novajet printer onto Hahnemühle Japan ‘rice paper’ by IMT on the Gold Coast. Victoria worked with artist Wim de Vos to design the bespoke handmade acrylic boxes. The design featured the ability for the box to not only serve as a container, but also act as a device to display the scrolls. Most elegant and fascinating photographic objects are Landscape stories, a series of five Asian-inspired scrolls. Cooper crawls, wanders and flies through the Australian landscape gathering hundreds of objects, patterns, and perspectives that she digitally intertwines, creating a continuum of almost imperceptibly diverse perspectives and a physical sense of vertigo in the viewer. In 2002 the triptych was acquired during its showing in the Toowoomba Biennial Acquisitive Award selected by Julie Ewington, then Curator at the Queensland Art Gallery. Interestingly the rules of the competition at the time restricted entries to work that had not previously won an art award–as such only the three scrolls The Story of the Hillside, Chaos and Order were entered. When purchased the two other scrolls were orphaned from the set. So here in this blog, we reunite the Five Stories from the Gorge presented in a form for you to scroll/stroll through … Enjoy. Your work is so inspiring Vicki. Would love to have a look at this exhibition. Thanks Jan – we will have one of the scrolls at the Meet the Artists on Wednesday 27.